“Their Finest Hour: Churchill, Roosevelt, and Stalin and the End of World War II” is the subject of a semester-long project of 13 University of Lynchburg museum studies students under the direction of Barbara Rothermel, assistant professor of museum studies and director of the Daura Gallery. The exhibition will continue through Friday, May 13. This exhibition is an overview of the “Big Three” — Roosevelt, Stalin, and Churchill, coming together to end World War II. The material contained in this exhibition will detail the importance of their leadership in the U.S., Soviet Union, and England during World War II. A major aspect of the show focuses on these three leaders at the conferences in Tehran and Yalta. 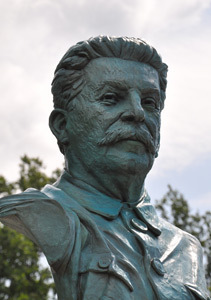 The exhibition will include casts of the portrait busts of Roosevelt, Stalin, and Churchill done by Professor Richard Pumphrey for the National D-Day Memorial. The casts are on loan to the Daura Gallery by Pumphrey. “This exhibit celebrates the College’s emphasis on critical thinking and academic inquiry, and I welcome that,” Pumphrey said. Other objects will be loaned by the National D-Day Memorial Foundation, the Lynchburg Museum, and Hugh Scrogham, a former LC staff member. The exhibition will also include a number of photographs, including photos from the Tehran and Yalta conference. The exhibition looks at the importance of the Second (Eastern) Front in the success of D-Day, military and civilian death tolls, the Allied victory and the end of the war, the Potsdam conference, and the origins of the Cold War. The 13 students working on the exhibit are fulfilling the requirements for a minor in museum studies. The semester-course focuses on the theory and practice of museum exhibitions. “Through the research and preparation of this exhibit, the students have learned the process involved in museum curatorial work. It is far more rigorous than they had ever suspected, and I am tremendously proud of their efforts,” Rothermel said. Laura Albrecht ’13 of Belvedere, N.J.; Elizabeth Burton ’12 of Whaleyville, Md. ; Carley Dobson ’13 of Salisbury, Md. ; John Griemsman ’13 of Ruther Glen, Va.; Nicole Hargett ’11 of Hampton, Va.; Mandie Middleton ’13 of Nokesville, Va.; Ellie Rapp ’11 of Vienna, Va.; David Satchell ’12 of Hampton, Va.; Christopher Spoden ’12 of Marshall, Va.; James Thornhill III ’12 of Madison Heights, Va.; Sarah Turner ’12 of Lynchburg, Va.; Justin Underwood ’12 of Middleburg, Va.’ and Jessica Wilson ’13 of San Antonio, Texas. The Daura Gallery is open Monday through Friday from 9 a.m. until 4 p.m. For more information, contact Barbara Rothermel at 434.544.8343.